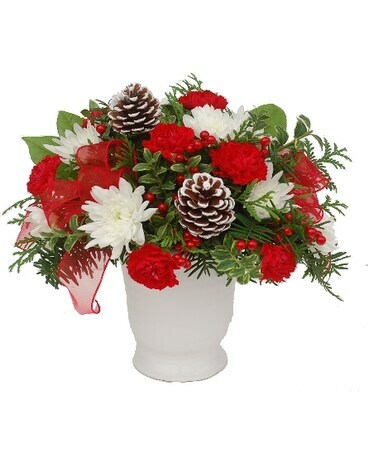 Our tall white ceramic pot is filled with a modern compact arrangement of winter greens,bright red miniature carnsations, crisp white mums, white tipped pine cones, red berries and cheerful red ribbons. Fresh and long lasting for enjoyment through the whole season. Increase to our Deluxe or Premium versions for a slightly larger and fuller arrangement. Made fresh at Helen Blakey Flowers for delivery in Toronto and across the GTA. For delivery outside our local delivery area, minor substitutions may be neccessary due to regional availability. Approx size 30 cm (12") tall X 27 cm (11") wide.